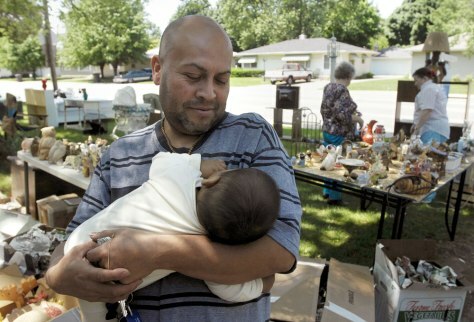 Angel Rodriguez holds his 4-month-old son Armando Miranda as shoppers look over items at his garage sale at his south Elkhart home. Rodriguez, his wife and two children are sleeping in one bedroom in a house they share with eight others. Rodriguez lost his job and his family’s trailer, forcing them to cut costs and sell many of their possessions.